To Facilitate or to Innovate? It wasn’t any given normal day it was the very second day for the Service Innovation and Design studies at Laurea. We’re all gathered up in our class room. Our lecturers and facilitators Gijs van Wulfen and Prof. Katja Tschimmel for this two day’s Design Thinking course were presented to us. Unlike normally lecturers would just introduce themselves but this time they introduced each other which I thought was fun and different. This already gave some hint on that this wasn’t going to be any ordinary two-day-course. Since our class didn’t mostly know each other beforehand they had planned some nice activities for us to get acquainted. Our multinational group was e.g. placed in big hall and we would take places there based on our home country’s geographical position. In smaller groups we did some sketching and telling stories about ourselves using post-it notes. This really prepared us for the great tasks that were ahead for us in the course not to mention the other tasks we’d do in the future. During the class I learned about different tools that can be used to observe current situation in design thinking process as photo safari and mood board. Also mind mapping method was used (which was already familiar to me from my Finnish studies in high school). There we actually saw ourselves that it’s very important to have facilitator guidance in the beginning of each task so that group won’t get the wrong idea and won’t go to wrong direction – especially when time is limited. Design thinking is usually a process including different developing stages – usually from three to five. These stages usually being: observing the current situation in a way or another, collecting the data, making prototypes and testing new ideas (failing and re-testing) – design thinker usually places bets fast (instead of measuring one and cutting twice) (Liedtka, Jeanne & Ogilvie, Tim 2011. Designing for growth). Once concept is proved as working and accepted – launching it to the market. Katja Tschimmel had presented various Design Thinking models in her research paper (Tschimmel, Katja 2012. Design Thinking as an effective Toolkit for Innovation) but I liked the most the “What is, What if, What wow and What works” -model presented in Designing for growth book I read related to this course (Liedtka, Jeanne & Ogilvie, Tim 2011. Designing for growth). It’s easy to remember and methods presented related to each stage were presented in visual and easily understandable way. The next week after the design course I had an opportunity to facilitate one mind mapping and target tool (as presented by Katja) session related to a small project at work. During the session I learned that it’s quite hard (if not impossible) to facilitate and think new ideas at same time. 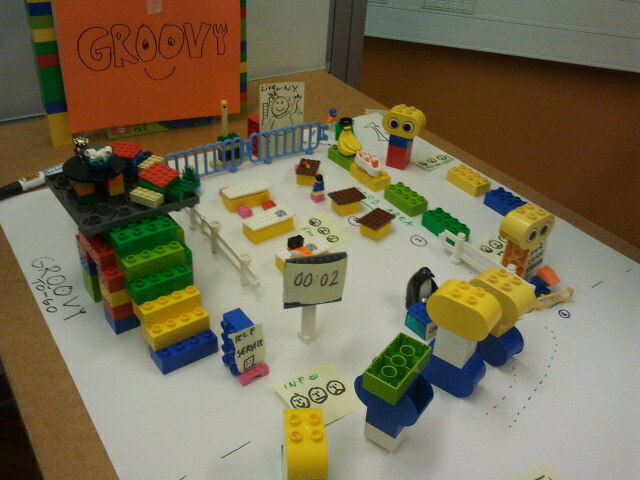 Also as I learned during the course it’s good to have diverse group of people in design thinking sessions. Again in my own innovation session the most interesting ideas came from a person who didn’t like design thinking session at all in the first place! After the session I felt like a winner – not only I was already able to use the skills I had learned from the school but get some results out of it too. I was able to give feedback to your Groovy restaurant, and it was nice to see that your group were able to elaborate on the feedback we gave you. I think this restaurant should be implemented at Laurea – I would visit Groovy fast lane over and over again :). Good work!